There is definitely no shortage of movie rental/streaming apps and services on the PlayStation 3, and now Sony has just announced VUDU will be joining the already available Netflix, Hulu Plus, and Sony’s own PSN movie rental service. 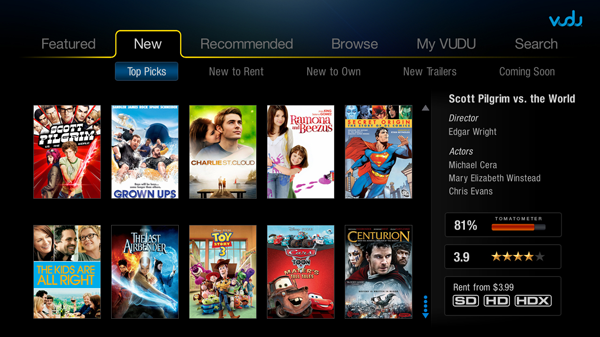 So what makes VUDU different than the other video streaming services that are already available to US-based users? Well firstly, the service does not require a subscription, unlike Netflix and Hulu Plus. Secondly the Hulu service only does TV shows, while the PSN movie rental service only provides purchases of content that must be downloaded to the console before viewing. So essentially, VUDU allows you to stream movies without the need of a subscription. Many PS3 users, depending on the amount of content they plan on viewing per month, may prefer this commitment-free service when compared to Netflix. Rentals through VUDU will start at $2, however HD movies with 5.1 surround sound may fetch a little more, somewhere in the $4-$6 range. Unfortunately, the service is currently only available to US based customers, the same as Hulu Plus.